Did you know that angels play ice hockey for fun? Have some fun with this coloring page, which also doubles as a story starter prompt. Fall is all about leaves, leaves everywhere. Have your kid color in these signs of the season as you gear up for stormy days, hot chocolate, and heavy coats. This autumn themed coloring page is great for kids learning about the four seasons, leaves falling or trees, and seasonal yard work. 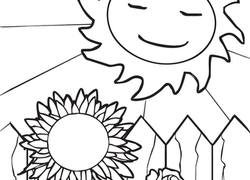 Help your kids celebrate the joys of summer with this sunny coloring page. Girls, time to get fashion forward! Color and clip a cute new summer outfit for your paper doll girl. 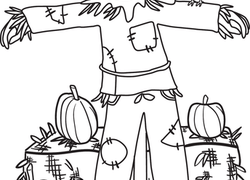 The scarecrow on this coloring page doesn't really seem to be doing his job--instead of scaring the crows away, he's giving them a friendly smile! Celebrate summer (and summer vacation!) 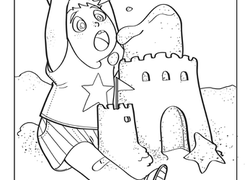 with this fun sandcastle coloring page. Color these leaves with some red and orange, like the colors they turn during the autumn months. This skip counting puzzle will get you and your child in the mood for the back to school season, and will reinforce important numbers skills, too. This little kid is having a bit of trouble building his dream sand castle. Can your child help him out by brightening the day with some color? This praying mantis coloring page features Harry the mantis, on the go! Come along on an adventure with him and don't forget your crayons. Color in this traditional American jack-o'-lantern, made of pure pumpkin. Take your winter vacation on the moon! This fun coloring page will transport your little artist to a new dimension of winter sports. Sing along to "Away in a Manger" with this festive print! This printable "Away in a Manger" design features lyrics to the Christmas carol and an illustration. Enjoy a day in the sun aboard this fun-filled ferris wheel! Your little one can build fine motor skills as she adds some delighful colors to this scene. With the friendly sun shining down, there's no better time to fly a kite! 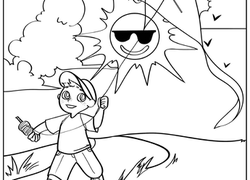 Get your kid excited about outside activities as he colors in this summer scene. Nothing says winter like a snowball fight! When you can't get outside or the snow isn't there, this coloring page is great indoor entertainment. When you start seeing the scarfs, sweatshirts and leaves falling all around you, you know it's autumn. Get ready for the season with a fun coloring page. Celebrate the joy of the holiday season with this cheer coloring page, set in a whimsical winter wonderland. Looks like this baby duckling just woke up from a nice nap! Color in these fuzzy friends as spring comes roaring in. This summer coloring page is great for any ocean-lover, and it'll give him some fine motor skills practice at the same time. This summer coloring page features two girls having a great time in the ocean. Spring is the season of rebirth! Get together with your little fawn to color this adorable scene, just in time for April showers and warmer weather.